The Mernagh family are your hosts at this picturesque farmhouse in Wexford. Welcome to Killiane Castle Country House & Farm, a 5-star hidden gem for those looking for Wexford Accommodation. Picturesque Killiane Castle Country House & Farm is a haven of tranquility and the ideal place for those who are looking for great Wexford Accommodation to stay in while you enjoy a full location experience in Ireland’s Ancient East. Situated in the south-east corner of Wexford in lush green countryside you will experience a haven of tranquility, “far from the madding crowd”. 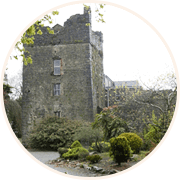 The Mernagh Family have been at Killiane Castle Country House since 1920, nearly 100 years. 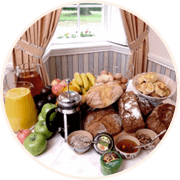 Our family run guesthouse located at the heart of Ireland’s Ancient East, provides the ideal base for Wexford Accommodation as you tour the many heritage & cultural sites of the area while enjoying the peaceful seclusion afforded by our luxury 5-star Farmhouse accommodation. We share our splendid 17th century home with you along with the adjoining magnificent 15th century castle whose walls echo stories from the past. When we welcome you to Killiane Castle Country House & Farm, you are visiting an authentic history rich castle and location. 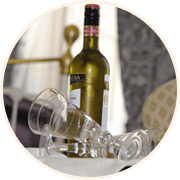 We invite you to explore and enjoy all that the location has to offer you during your stay. Our guests are welcome to explore the Castle and enjoy the great view from the top of the tower, go for a ramble on the farm walk through the old beech grove or even see the cows being milked! 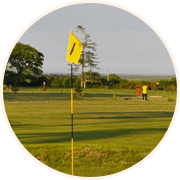 We also have a golf pitch and putt course and driving range, tennis court and croquet lawn. Alternatively, you can just relax in the beautiful gardens or in the evening by the open fire. As Wexford Accommodation goes we are ideally located, only 3 miles from medieval Wexford town and 8 miles from Rosslare Europort and beach resort, and easy driving distance with good accessibility to all routes and airports, Killiane Castle Country House & Farm is the unique and perfect bed and breakfast destination for your stay in Wexford. If you are looking for a unique experience, award winning service, with peace, quiet & relaxation this is the ideal place to stay. You are assured of a warm welcome at Killiane Castle from Paul & Patrycja!